The importance of music as a soundtrack to storytelling is clear. Equally clear is the need, as filmmakers, to correctly license the music you use so that the composers and recording artists are paid for their work, and to avoid legal issues further down the line. A Cue Sheet is effectively a list of all the music used in your film, along with other key information, that enables Performing Rights Organisation to identify where songs they are responsible for have been used in film and television productions, and collect Performance Royalities on behalf of their members. In the UK, the relevant PRO is PRS for Music who collect royalties on behalf of their songwriter members, in the US it’s ASCAP, BMI and SESAC and in Australia and New Zealand, for example, APRA. 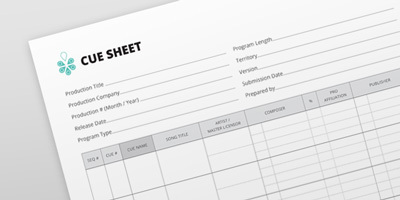 A Cue Sheet contains key information about the filmmaker or production company in an overview section – including name, address, contact information and details of the media/territories agreed. The main body of the Cue Sheet contains information about each piece of music used and the scene within the film that it soundtracks – including the songwriters, artist, label, publisher and PRO affiliation, as well as, for example, the duration of music used and the type of usage. Who should receive the Cue Sheet? The Cue Sheet should be submitted to any party responsible for collecting or paying/distributing performance royalties. On the collection side, the Cue Sheet should be submitted to each PRO who has a member represented on the Cue Sheet. Most countries have their own PRO and their website will contain details of how to submit. On the payment side, the Cue Sheet should be submitted to any organisation responsible for screening or selling your film, including Film Festival organisers and your Distributor. Some music licences also require the Licensee – the filmmaker – to send a copy of the Cue Sheet to the rightsholder (label/publisher) once complete. What if I don’t complete a Cue Sheet? Aside from the artists and composers not being fairly compensated for their work, many film festivals won’t accept your film for consideration without a cue sheet, alongside the accompanying licences you’ve agreed for using the music – and distributors definitely won’t. So if you’re making a film with the intention of submitting to film festivals or seeking distribution, make sure you – or your Music Supervisor if you’re working with one – complete a cue sheet! Here’s a template, which includes a list of the main required information, to get you started. An interactive PDF file, which you can fill out on your computer, save, print and email. If you need a version with no Filmsourcing branding and ALL text editable, check out our Whitelabel and Premium bundles. Storyboard Music – music supervisor and curator for sync, live events & editorial content.